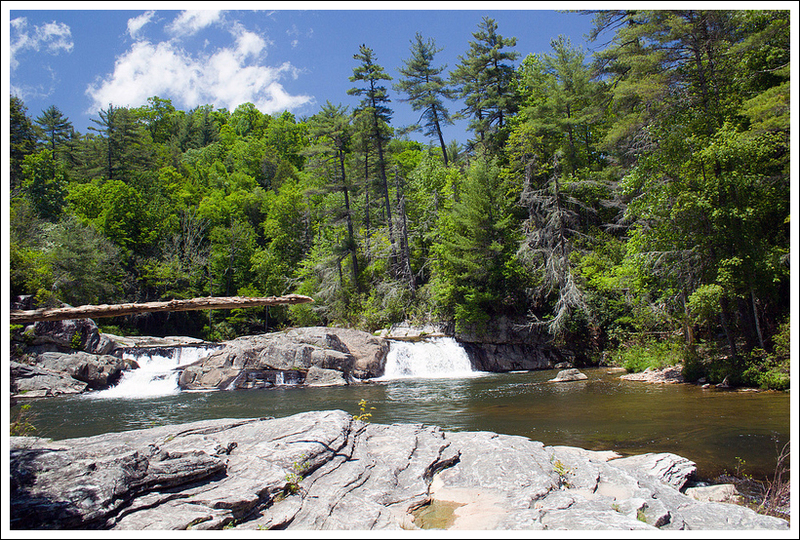 This wonderful little network of trails gives you the opportunity to view Linville Falls from every angle! You can choose short/easy routes or longer/harder routes depending what you’re in the mood to do. When all was said and done, we hiked a little over 3.5 miles and enjoyed several views of the falls. 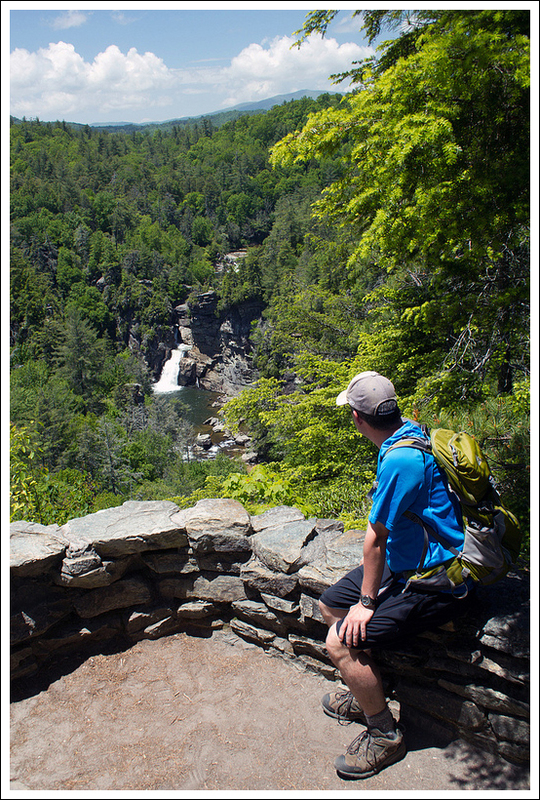 Adam enjoys a bird’s eye view of Linville Falls. 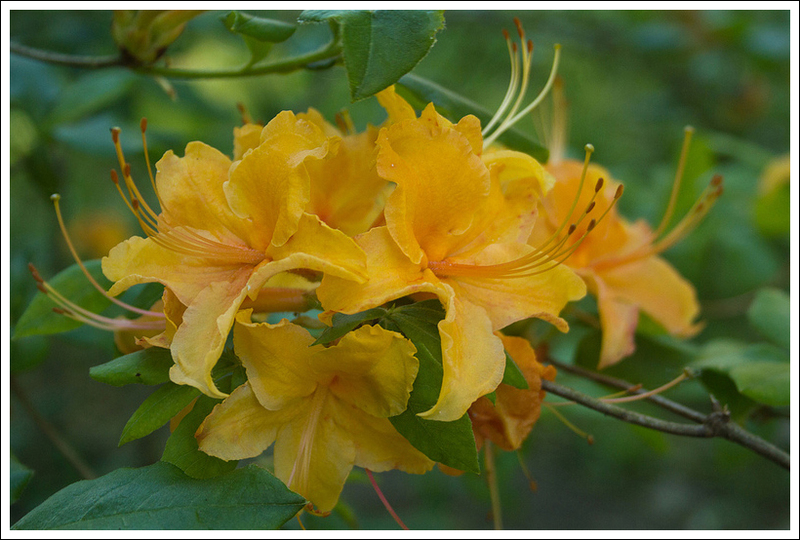 Below: The forest service information station; the trail network offers many options; beautiful blooming rhododendron. To finish our trip to North Carolina, we had to visit Linville Falls along the Blue Ridge Parkway. While overcast days are better days for photographing waterfalls, we had to take what we were given. The sun was high in the sky and it was quite hot on the hike, but we knew this wasn’t going to be too long of a hike. We drove up the gravel Wiseman’s View Road and went first to the USFS Visitor’s Center. Two women were inside and gave us some information on how to tackle the falls. We were looking for a place to eat lunch before the hike and they recommended Famous Louise’s Rock House, especially for their pies. We took their advice and refueled for the hike. We ventured back up Wiseman’s View Road and parked in the large gravel lot at the to the left of the road. The trail starts from the eastern side of the lot and begins with a steep descent. At about .2 miles of a descent, we reached a junction. We took a right here to make our way to the series of overlooks of the falls. In a short distance, we reached another smaller junction with the trail to the Upper Falls, but we decided to approach that on the way back. Since there are so many choices to make about the order in which you take in the views, I will not list all the distances; but you can tell from the downloaded map the distances to each. We opted first to take a left for the trail to Chimney View, which provided a viewpoint to see the upper and lower falls. From this point, we backtracked to the main trail and took a left. Shortly, we came on to the side trail on the right for the Gorge View. The views from here showed the canyon of the gorge but the views didn’t allow you to see the bottom of the canyon. Next was the end of the main trail, which ended at Erwins View. This view gave you the furthest view away from the falls, but it was still spectacular. We backtracked and made our way back to the Upper Falls viewpoint. From here, you could see the water plunge down the falls from a closer distance. The upper falls view. Below: A view into the gorge; Adam hikes along. 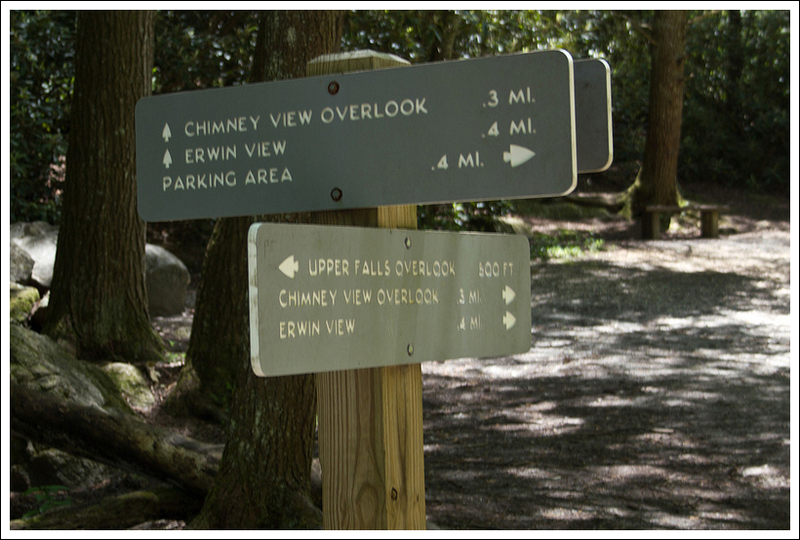 From seeing people on the opposite side of the water and very close to the falls, we decided to take the trail down to the Linville Falls Visitor Center. The trail was wide, road-like and going slightly downhill. We eventually came to a bridge over the Linville River and the Visitor Center was on the opposite side. We grabbed a few cold waters from the center and talked to the rangers about the trails on the other side. We were fairly tired by this point, since we had done so much hiking during the week, but the temptation of the falls kept us pressing forward. From the front of the Visitor Center, the trail headed into the woods on the eastern side of the building. In a few feet, the trail branched and we took a right to head to the next overlook. This trail branched off after about .3 miles. We took a right at the junction, descending to reach the Plunge Basin overlook at .5 miles. This point gave you a vantage point to see the water shoot through the gorge and down below. We watched one man standing on the cliffside below, fishing from a precarious position. We then made our way back to our car by returning to the Visitor Center, back across the bridge, and taking a right to the trail junction that led us back to our vehicle. We had a great time visiting Linville Falls and this is definitely a hike that most people could do with their families. A return trip in the peak of fall color with an overcast sky is something we will try to do. While many waterfalls allow you to get very close to them, the trails here mostly keep you at a distance. However, the view of the gorge with the waterfalls is breathtaking. 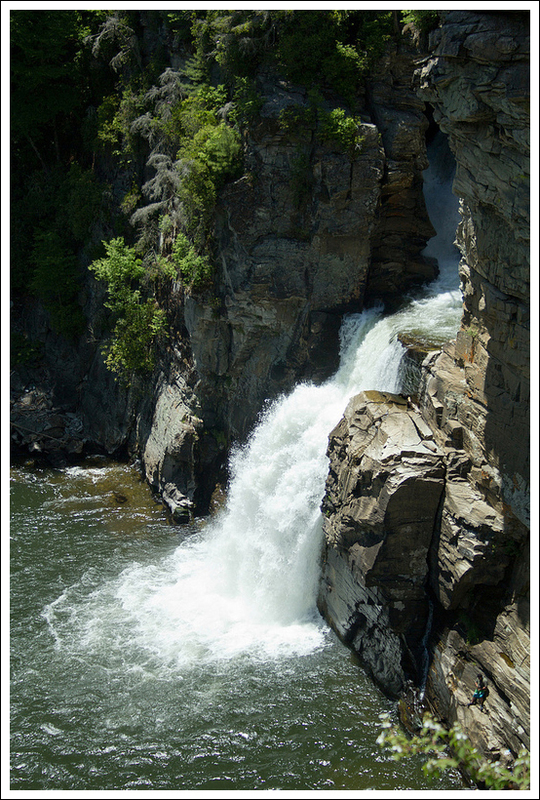 Linville Falls were a gift to the National Park Service from John D. Rockefeller. So many of our favorite parks would not have existed without his generosity. Acadia, Shenandoah, Yosemite, the Grand Tetons, and the Smokies were all established, in part, due to his financial support. The plunge view of the falls. 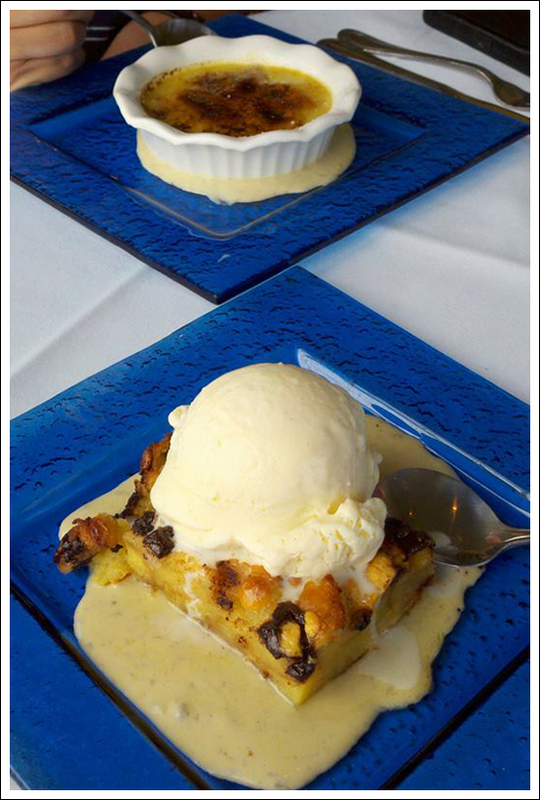 Below: The Linville River; Beautiful desserts from Storie Street Grille. Adam did a thorough job describing all the different paths we took, so I don’t have a lot of details to add about the terrain. The only thing I would say is that you can walk to the bottom of the falls. It’s about about .8 miles of hiking (some steep). We opted to skip the view from the bottom on this trip, mainly because we were tired and could tell that the base of the falls was extremely crowded. I enjoyed stopping in the visitors center and talking to the park ranger. He was a pretty serious hiker and we enjoyed trading trail tips. He suggested Crabtree Falls, NC for a future hike. I was also fascinated by the cross section of an enormous tree hanging in the center. 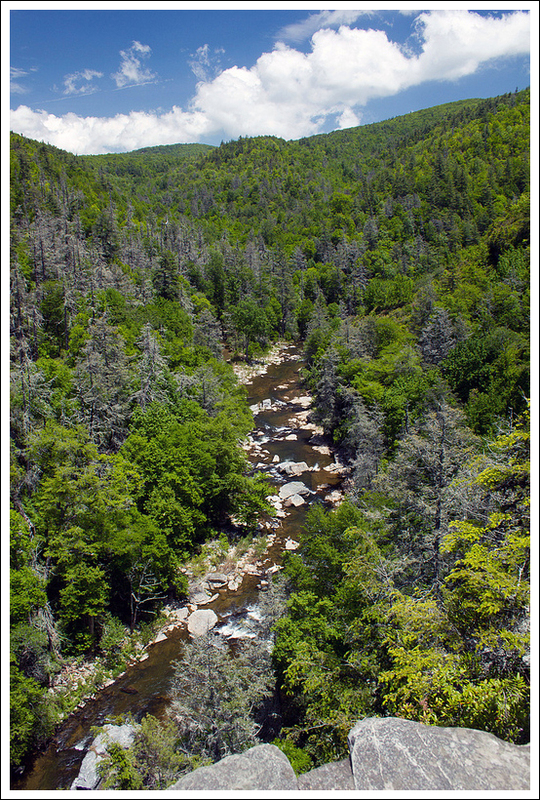 It fell when the Linville Gorge flooded in September of 2004. The hurricane-related flooding was so severe, that it washed away half of the visitor’s center and left many gigantic, toppled trees in its wake. Water is such a powerful force! Linville Falls has one of the highest water volumes of any waterfall in the Blue Ridge, so it’s not surprising that it floods so easily. The high volume of water also makes the gorge perilous for people. Swimming is not allowed in the river near the falls, but numerous fatalities have still occurred in the area. After finishing our hiking for the day, we retreated back to our cabin at the Pineola so we could get showered and dressed for dinner. We decided to go fancy for our last evening in the area, and enjoyed a fabulous dinner at the Storie Street Grille in Blowing Rock, NC. In addition to lovely outdoor patio seating, hey had a great wine line, beautifully prepared entrees, and amazing desserts. Even though I’d already had pie a la mode earlier in the day, I could not pass up their dark chocolate – coconut bread pudding. Adam’s banana creme brulee was equally delicious. It was a fitting end to a fabulous trip! 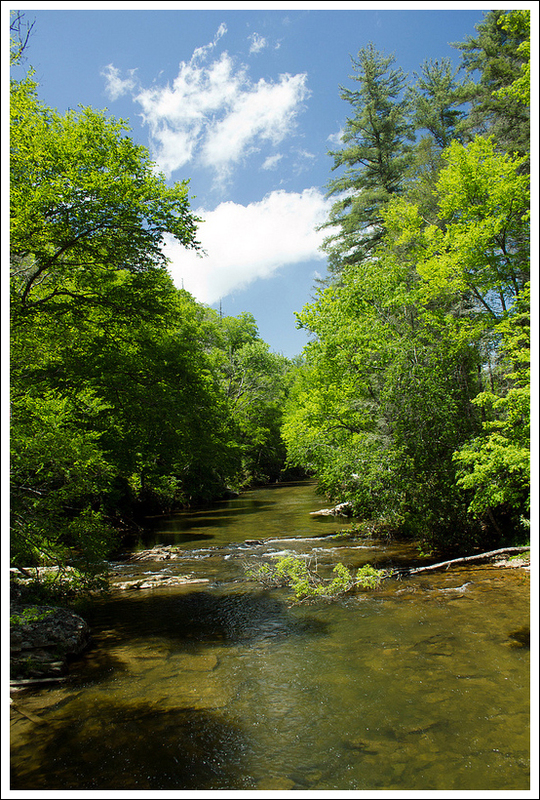 Our next post will actually be a Virginia hike – shocking! But then we’ll be going back to some more out-of-state posts. We’re headed for the White Mountains of New Hampshire in a couple weeks, and are hoping to bring back at least a couple posts from that area. Stay tuned! Elevation Change – 350 ft. Difficulty – 1. The trail does have a little climbing up and down on the trail, but most people should be able to do it without too much trouble. We saw people of all ages and all levels of fitness on the trail, so it should be doable by anyone willing. The options for different viewpoints allow for people to choose what they can handle and decide when to stop. Trail Conditions – 4.5. Most of the trail is either gravel or dirt and is well-worn. Views – 4. Great views of the gorge and waterfalls. Streams/Waterfalls – 5. There are many viewpoints to see the waterfalls. The only challenge will be to enjoy it with few others around. Wildlife – 1. You may see squirrels and some birds flying around, but it would be unlikely to see much else. Ease to Navigate – 4. There is a large branching of side trails here, but using the map should guide you along. Solitude – 0. 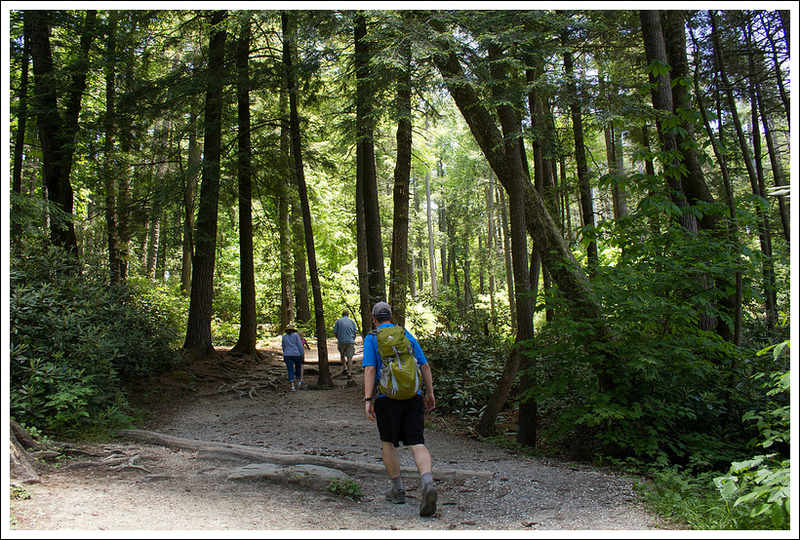 With such a close proximity to the Blue Ridge Parkway along with the ease of difficulty, this hike is crowded. 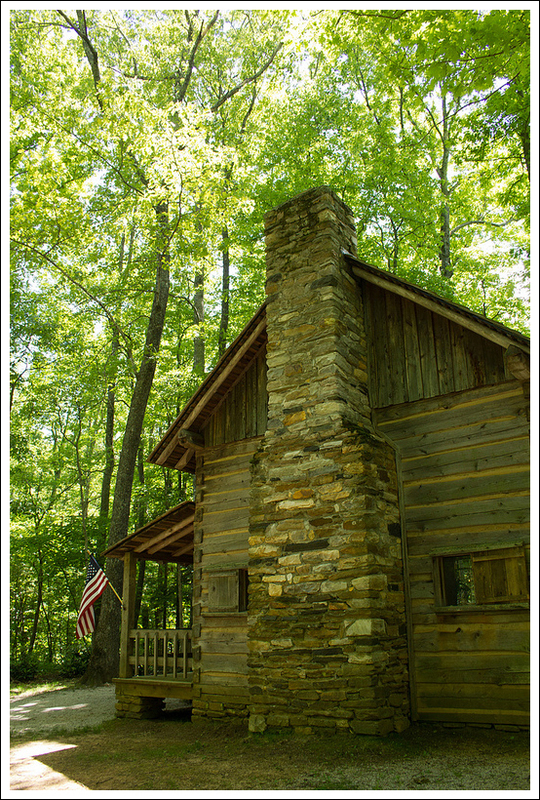 Directions to trailhead: From US 221, turn on to NC 183. In .7 miles, turn right on to Wisemans View Road at the large curve. The parking lot is a short distance on the left and the trail starts from the eastern side of the parking lot. Adam and Christine, I just wanted to take a moment to tell you just how much I love this website. Last year my father passed away here in Texas, we are from Richmond,Va and I moved to Houston when I was 13, but before my dad passed he requested that his ashes be spread in a place of Natural Beauty in his home state of Virginia. I remembered hiking up to Humpback Rocks as a kid on Blue Ridge Parkway, so that’s the place my siblings and I took him and it was a beautiful day in August 2012 that we honored his request, that trip I decided to explore the area a bit and I fell in love with it. So much so I find myself regularly going online looking for jobs and real estate. I’m seriously considering putting my house on the market and moving back to my home state! I simply love to hike and it’s kinda slim pickings down here. I can’t tell you how much I love reading your hiking stories along with pictures and I even felt profound sadness when you lost your cute little dog. I was there just last month and picked a couple hikes in SNP based on your stories. I’m coming back in mid October for fall colors. I can’t wait. May even end up moving back up there. You are soooo lucky to live where you do. Keep the stories and photos coming. Thanks so much. Thank you for your very kind comment, Eric! We sure do enjoy sharing our trail tales and always feel deeply rewarded when we hear that someone enjoys them. Thanks for taking the time to write about your adventures ! I did linville falls last week and it was awesome with all the waterflow (from all the rain). Next time you are in the area check out wisemans overlook. I was there today and it was spectacular. Thanks Sal. We missed the Wisemans Overlook this time because we were short on time, but will definitely check it out next time.